Well Christmas is upon us again and just time for a quick blog before getting back to the workshop. Our new website is up and running and looks great just needs a few tweaks. 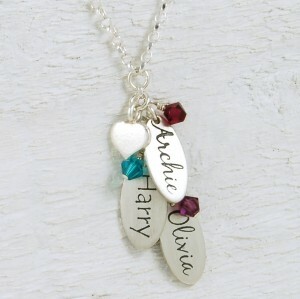 Our silver personalised necklaces are taking off really well – we started off with just the one name tag but we were getting messages sent to us asking for two name tags then low and behold it has been three and four name tags so its getting rather busy but I’m not complaining as we must be doing something right! We were hoping to bring out a few more personalised items such as the etched charm bracelet and the memories bracelet but we will have to put them back for the start of next year as we simply do not have the time right now but we really want to expand this range as I love making the personalised jewellery as it gives you a feeling of great fulfilment that the piece you have made for someone is a treasured keepsake forever. This entry was posted on Sunday, December 6th, 2009 at 10:47 pm	and is filed under Handmade Jewellery.